Very late in the afternoon, just as the sun was setting, the juvenile Harp Seal attempted to head back to sea. He began to scooch and wriggle toward the creek, pausing often to scratch and roll around in the sand. At one point he reversed direction and started back toward the dunes. As you can see in the last photo of the above gallery that just as do Harbor Seals, Harp Seals have a tail, too. After a few more false starts he made his way to the water. Before sliding in, he paused at the water’s edge to drink. Nearly dead low tide, the water was not deep enough to swim. It was painful to watch him splash and undulate along on his belly in the shallows. He seemed to tire quickly and was very undecided about what to do next. We watched as the young seal made his way slowly around a sharp bend in the creek, then held our breaths as he made it all the way to the foot bridge. But then he suddenly stopped, turned around, and swam back down the creek, nearly the whole length of the creek from where he had come. The young seal seemed confused and it was heartbreaking to see. When I left at sundown he was on the flats in the creek. Good Harbor Beach resident and Piping Plover monitor Sue W. reports that he is still there at 7:15. We’re hoping he makes it out at low tide, which is at 10:11 tonight. 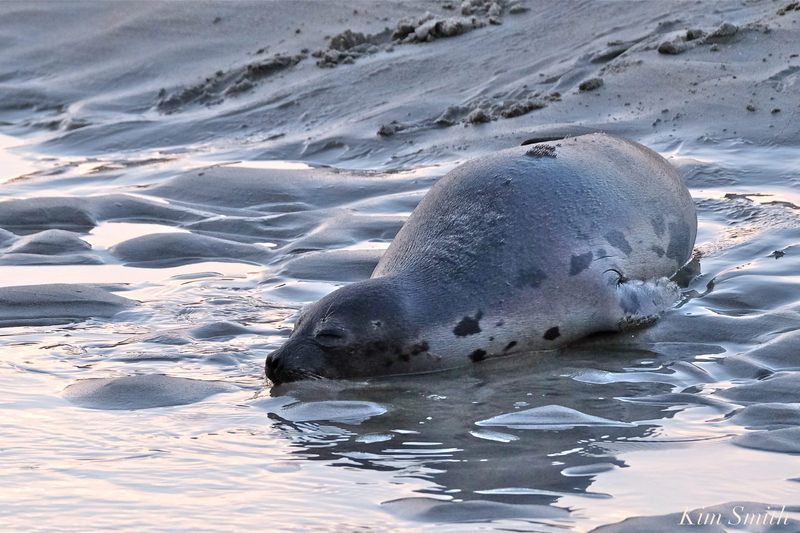 The young Harp Seal appeared very tired when I left the beach at around 5:30. 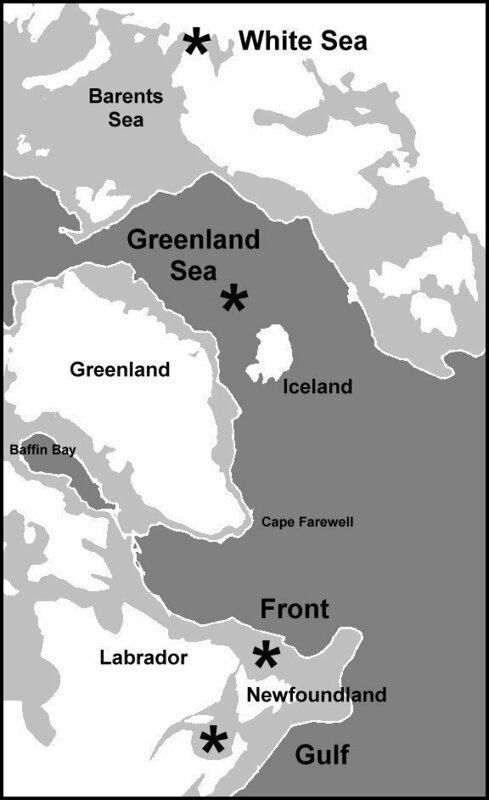 Many, many thanks to Jane Goodwin, neighbor and Good Morning Gloucester reader, for alerting us to the Harp Seal. For turtle, seal, and all mammal strandings, please call NOAA at 866.755.6622. Thank you! I checked on the little guy at 5:30 this morning on my way out of town to photograph and didn’t see any sign of him, but it was pitch black. I checked again on my way home, around 11am, still no sign, and there did not appear to be any signs of a skirmish with a coyote. The tide was high and the water was up to the top of the creek bed. It would have been much easier for him to slip into the water last night and head back out to sea. This entry was posted in Cape Ann Wildlife, Good Harbor Beach and tagged Good Harbor Beach, Harbor Seal, harp seal, juvenile Harp Seal, Pagophilus groenlandicus, seal hauled out, seal stranding, what to do if you find a seal on the beach on February 3, 2019 by Kim Smith. BEAUTIFUL HARP SEAL RESTING TODAY AT GOOD HARBOR BEACH! A beautiful young Harp Seal spent the better part of the day hauled out between the bank of the Good Harbor Beach creek and the dunes. The seal appeared in good health and was seen resting, stretching, scooching, and sunning. Beach walkers and dog walkers were respectful and kept a safe distance. Ainsley Smith from NOAA was on the job letting folks know that the seal was okay and that this is perfectly normal seal behavior. Thanks so much to Ainsley and to all the beachgoers today who kept their distance from the Harp Seal. For turtle, seal, and all mammal strandings, please call NOAA at 866.755.6622. Thank you! I’ve been checking on him periodically throughout the afternoon and will let you know when he makes it back to the water. I hope soon because we know coyotes scavenge the beach at night. Harp Seals are born in the Arctic during the late winter. They are born with a lanugo, an extra thick fluffy white coat that keeps them warm on the Arctic ice. During each stage of development, the Harp Seal’s coat has a different appearance. Juveniles have a white coat with widely spaced spots. Every year, the spots move closer together during molting. By the time the Harp Seal reaches adulthood, the coat is silvery gray with a black saddle mark on the back and a black face. 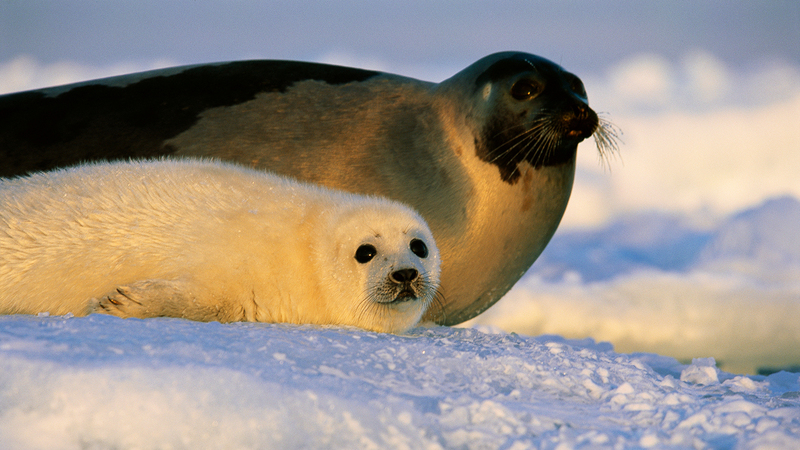 See the photo below of a baby and Mom Harp Seal. A mother harp seal and her pup rest in their icy habitat. This entry was posted in Cape Ann Wildlife, Good Harbor Beach and tagged Ainsley Smith, Good Harbor Beach, Harbor Seal, harp seal, juvenile Harp Seal, Pagophilus groenlandicus, seal hauled out, seal stranding, what to do if you find a seal on the beach on February 2, 2019 by Kim Smith.